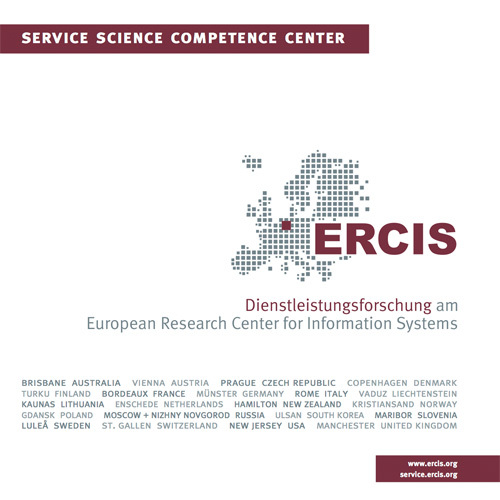 MMB & DFT 2016 | ERCIS Competence Center "Service Science"
The workshop discusses challenges and opportunities that arise from the embedding of e-mobility and smart grids in an inter- and transdisciplinary setting — an embedding which will become crucial but non-trivial to achieve, as e-mobility becomes increasingly commonplace and fully adopted by the public. The workshop will discuss regulations and concepts that are able to ensure a successful integration of charging infrastructure for e-mobility and smart grids. The workshop is especially concerned with the long-term effects of a large population of e-cars for the power grid. However, we also aim at discussing appropriate measures to increase user acceptance of e-cars and how known mobility patterns of users can help to reduce the impact on the grid. battery technology and battery modelling. The workshop is organized in cooperation with the conference MMB 2016. Please register via the conference registration at http://www.mmb2016.de/page/registration. You are also welcome to join the conference reception on Monday evening, which will take place at the ‘Akademische Bieranstalt - Blaues Haus’.